A Remembrance: The Great Animals That Died In 2016 : The Two-Way This year has become widely known for celebrity deaths, but a number of great animals have also died this year. 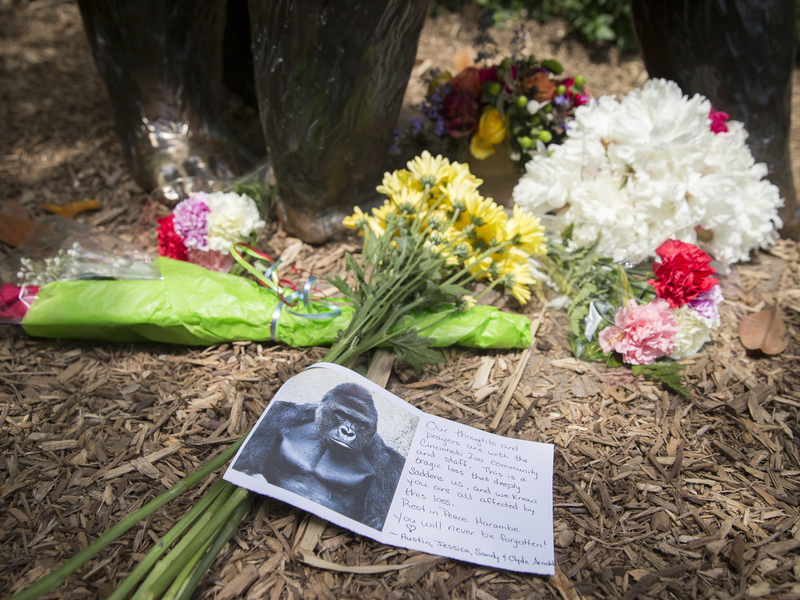 Flowers and sympathy cards for Harambe the gorilla at the Cincinatti Zoo. This year was one for celebrity deaths, human and animal alike. In a year that has become widely known as being the worst, a number of beloved artists and musicians have passed away. From Prince, to George Michael, to Carrie Fisher, to David Bowie, to Debbie Reynolds, the Internet has mourned and remembered some of the greats. But 2016 was also a big year for a different sort of celebrity deaths: the animal variety. Our furry friends may not have "words" of wisdom per se, but our obsessions with them might tell us something about ourselves. Of course, there was Harambe. The gorilla was killed at the Cincinnati Zoo when a 3-year-old boy slipped into his enclosure, and the Internet kind of lost its mind. Then, there was Bretagne, the 16-year-old golden retriever who was the last known surviving Sept. 11 search dog. As NPR reported at the time of her death: "With handler Denise Corliss, Bretagne looked first for survivors, then for remains. They worked at the site for 10 days. Bretagne was both a dedicated worker and a source of comfort for the human search and rescue teams, according to Corliss and others who worked with the golden retriever." Then, just this week, Pan Pan passed away in China. The giant panda was the oldest-known male panda at 31 years old. Pandas are famously difficult to breed, but Pan Pan had no problem at all: He has been dubbed the "panda grandpa" for his many offspring, and has at least 130 descendants worldwide. Earlier this year, the world's oldest known panda Jia Jia passed away at 38. Cookie the cockatoo also passed this year, at the age of 83. The cockatoo was a favorite of visitors to the Brookfield Zoo, where he was the last surviving member of the original collection of animals, according to the Chicago Tribune. Tim Snyder, the curator of birds for the zoo, told the Tribune that when Cookie was happy or wanted attention, he would say the only word he knew, over and over: his own name. Sort of like someone else we know. And Toughie, the so-called loneliest frog in the world, died in Atlanta in September. According to reporting from WABE in Atlanta, Toughie was the last documented member of his species.